A new study just released examined the potential link between the chemical commonly used as an antibacterial in soaps and lotions, and overweight kids. The offending chemical is triclocarban (TCC); it is an endocrine-disrupting chemical which means it messes with human hormones. 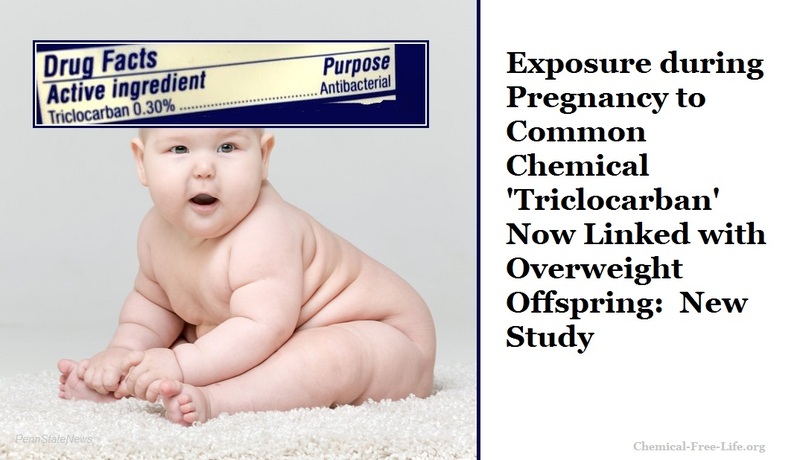 The study, conducted by Lawrence Livermore National Laboratory scientists, demonstrated that exposure to environmental levels of triclocarban (TCC), an antibacterial chemical common in personal care products like soaps and lotions, including those used by the medical field (such as in hospitals), can transfer from mother to offspring and interfere with lipid metabolism. This study represents the first report to quantify the transfer of an environmentally relevant concentration of the chemical TCC from mother to offspring. Lipids are naturally occurring molecules that include fats, waxes, fat-soluble vitamins, monoglycerides, diglycerides, triglycerides and others. What do lipids do, exactly? The main biological function of lipids is storing energy and signaling, and acting as structural components of cell membranes. What do the results mean in real life? Solutions: Pregnant women should carefully read the ingredients on all products prior to purchase/use. Avoid all products that include triclocarban (TCC) or triclosan. Whenever possible use certified organic products or make your own personal care products using fresh ingredients.